Now they come out with the model? I've already got my two done. Go figure. The point is, there are lots of these great war machines out there. They may not be as prevelant as Land Raiders in 5th edition now but it seems like every Space Marine player has one of these guys in their carrying case. Whether or not he see's the battlefield is another story. I run two in my Deathwing now, but it's always been a crazy affair between me and dreadnoughts. I love the idea of them, the Veteran wounded and placed inside the machine so that he can continue to fight for the Emperor. I used to have 2 in my Black Templar force, but they would come and go as I changed my list over time. Ultimately they were dropped in favor of bikes, but I don't think I knew how to use them back then and I wanted something that "did better." Jump ahead to now and I still don't know how to use them that well, but there aren't many options in a traditionally "pure" Deathwing army. That and like I've said before,I'm at that point now where I'm going to play with the units I think are cool (Dreadnoughts!) and figure it out from there. Here a dread escorts the lone survivor to the objective. If I think about it, they've done remarkably well for me. They've been able to take a considerable amount of damage and keep going. They've even changed the course of the game on a rare occasion. And... there have been the instances where they've been reduced to nothing more than a smoldering pile of rubble in the first turn. Such is fate I suppose. I still love using them, good or bad, worth the points or not, it doesn't matter to me. I don't even have them loaded out any particular way. One of them has a lascannon and the other has a multimelta because that's what he came with. I'm willing to bet it doesn't even matter what the weapon loadout is in the end. That's a whole discussion to itself though. 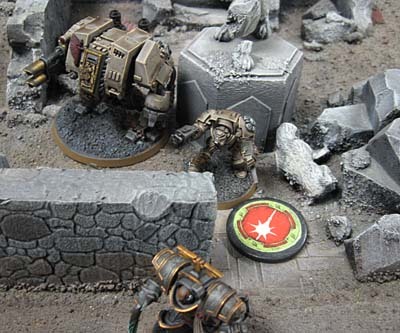 So, if you're one of those players with a unit (like a dreadnought) you love to use but you find yourself leaving it in your case for something "better," dig it out, make some room in your list and get it on the tabletop. It might take some time to learn how to use it, but I'm willing to bet you'll enjoy your games much more. As for me, I'm going to keep my two dreads in my list. I'm having too much fun using them to take them out, regardless of how they do. I just remind myself that everything is expendable with Deathwing. I just need some air support now. 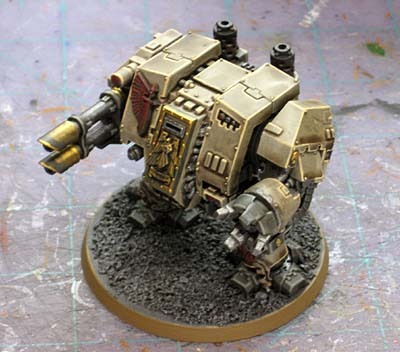 Dreadnoughts just look so cool. I have four, though only one is painted. The other three I've magnetized so I can use multiple arm variants. Funny that you post this as I finally decided to get my rifleman arms completed so I'm in process of converting those right now. I gave up counting my dreads, I have four or five chaos ones, and seven imperial ones if you include the unassembled Ironclad on the desk. I just love the design. If you ever get the chance check out some of the sketches by Jes Goodwin in "The Gothic and the Eldritch" (OOP). There are some really revealing things in there, plus a few conversion ideas. I'm a blood angel player, and it's hard to leave home without my Furioso dreadnoughts. I love the models, and love the way they perform on the table. Can't wait for the new dex with rumored armor 13 on the front! So sweet. I love Dreadnoughts. I always field 1-3 of the buggers on their own flank, Since mine are all raging insane chaos dreads I arm them with Missile Launchers. That way if they fire frenzy I just pick the Frag missile. Hardly enough to chip the paint on most vehicles. Best done if you have a landraider or other troop transport with them as well so they can actually claim objectives. Since I'm mentioned in the blogroll here I figured I'd comment on it too. I usually run atleast 1 if nto 2 dreads in my regular marine lists. In my DW list I may use one for fun but in tournament it's all terms and LR's so no room for the dreads. I love the models though, they are one of the reasons I chose marines as an army and in my beginning days of 40k I had a dread in every single list I played. With the new BA dex coming out and the new dread possibilities (if the rumor mill codex is real.) i'm super stoked with the new plastic dread as it will bring about my long awaited chaplain dread conversion. WOOHOO. I also love the idea of the Dreadnought, but I'm even more a fan of how they look. In all my practise games I've had one a side to see how they work out in slightly different scenarios and as (with everything) they massively vary. In one battle my Dreadnought took fire from another readnought and atleast one other squad every turn they were in range and still survived (though I couldn't get a shot off all game) - but I'd still say it earnt it's points back by drawing fire away from other units. I'm also a bit annoyed they release this model now. 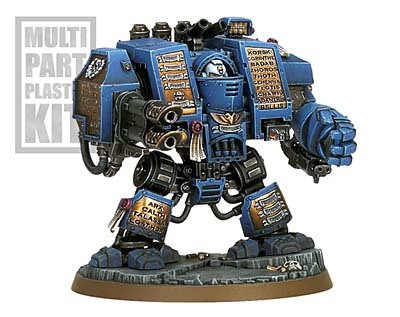 I've got a 'normal' Dreadnought, ironclad, metal venerable, Forgeworld venerable and Bjorn - yet I know I'll still buy one. I have to say, I'm not that keen on the "stamdard" dread. They look too stumpy to me - and the sarcophagus front is just very uninspiring. I much prefer the venerable "head" on the new one and the forgeworld one, and the pre-heresy design for dreads is great - they look like huge terminators, which is qite fittng considering the design brief in developing TDA. I'll certainly be buying the new kit for those head components to convert a couple of the old designs. I have to say that Dreds were one of the key draws for me to the game. I know that I have had the dred “variant” for almost every army I have collected. Killa kans, Ork Dreds, Sentinels, whatever the tau version would be (piranha or battle suit had multiple of both), chaos dreds, imperial dred, and finally my favorite Carnifexes. I like the thought of battle with larger than life machines/beasts rampaging across the field, clashing with one another or others. Doing as much damage as they can before they are brought down.